This project involves improvements to the parking lot and beach access from Neptune Avenue to Beacon’s Beach to mitigate the impacts of the area landslide. Beacon’s Beach bluff, parking lot, and access trail have been subject to landslides throughout the past several decades. These land movements have impacted beach access safety and threaten the public parking lot stability. Project implementation is dependent upon approval by the California Coastal Commission (CCC), agreement with the California Department of Parks and Recreation, which owns the beach, and review by regional agencies such as the Surfrider Foundation. The project area is at risk of landslide, which could be reactivated by such hazards as earthquake, wave uprush from heavy storm activity and sea level rise, and winter storm damage. Landslides have occurred in this area several times in the past. The landslide encompasses virtually all of the coastal bluff below the parking lot down to the beach, including the public parking and public access. Currently, the landslide is only marginally stable, with site conditions becoming increasingly more precarious with further decreased geologic stability. Ongoing coastal erosion and the seismic setting of the site present risks that could trigger instability in the short term. Minor earthquake shaking is believed to be a likely landslide failure trigger. 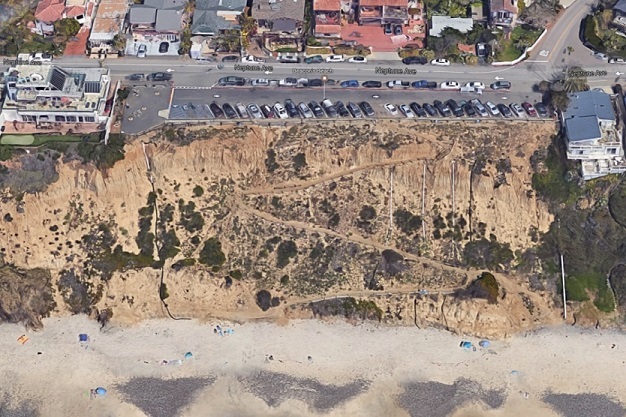 A landslide will affect the ability to access the beach from the top of bluff at Neptune Avenue. This project aims to provide ongoing beach parking and access. Protect health and safety of the public. Preserve access to Beacon’s Beach. Maintain existing trail at current level of maintenance. Construct a permanent and safe stairway access to the beach. A sensitive low scale beach access solution that responds to the existing topography and place. Integrate soft materials into the project. Reflect the unique character of the Leucadia community in the design, as well as artful design details. Incorporate a seasonal lifeguard platform. Work within the budget for the project. The project’s planning and design budget is $750,000. Construction is anticipated to cost on the order of $3.5M. The City Council initiated the preliminary engineering and environmental phase for this project in August, 2017. This project proposes a new beach access stairway connecting a series of pier-supported landings down the face of the bluff. The design of the relocated parking lot will attempt to minimize the loss of parking spaces and the preferred configuration will allow for vehicles to exit to W. Leucadia Blvd. The current parking lot configuration accommodates 25 spaces within the parking lot. The reconstructed lot may accommodate approximately 16 parking spaces, with the actual number to be determined during design. The current switchback trail is proposed to be maintained in place. The project may include additional amenities currently under consideration, such as a permanent location for a lifeguard tower to be placed, a shower at the beach, and a water fountain.